Shunsuke Wada, an engraver, was born in 1983 and raised in Takaoka City, Toayama, Japan. After graduating from college, Shunsuke joined a game development company to work as a CG designer. During his six years as a designer, Shunsuke worked on entertainment machines. 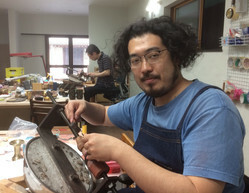 In 2011, Shunsuke decided to head back to Takaoka to help out his family business of engraving, and to eventually succeed the craftsman position as the fourth heir of the Wada workshop. As a child, Wada loved otaku culture including anime, manga, movies, games, and tokusatsu. In 2013, Wada began the "TakaOtacraft Committee" with his fellow craftsmen from Takaoka. The mission of TakaOtacraft is to bring traditional craft art and anime together. Wada loves figures and dolls.